Rep. Jason Spencer's on-camera conduct horrified fellow Republicans, some of whom called for his immediate resignation. ATLANTA — A Georgia lawmaker is the latest public figure caught with his pants down on provocateur Sacha Baron Cohen's new cable TV series, this time literally, as the state legislator exposes his bottom, speaks with a mock Asian accent and yells a racial slur all in the name of fighting terrorism. In Sunday night's broadcast of Cohen's Showtime series "Who Is America?" 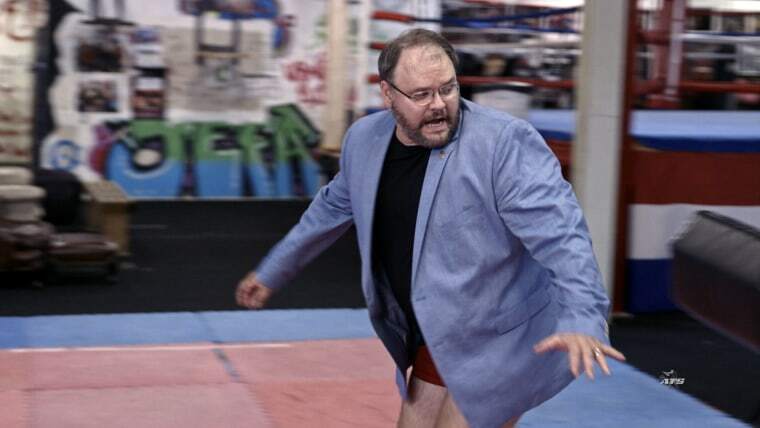 Cohen poses as an Israeli military expert who persuades Republican Rep. Jason Spencer to take part in several outlandish exercises. The lawmaker is told they're making a counterterrorism video. Spencer repeatedly shouts a racial slur for black people after Cohen tells him the tactic is useful for drawing bystanders' attention to an unfolding attack. He also drops his pants, then his underwear, before backing his exposed rear end toward Cohen while shouting "USA!" and "America!" Cohen told Spencer the move would incite fear in homophobic jihadists. The segment also shows Spencer speaking with a mock Asian accent while pretending to use a selfie-stick to surreptitiously insert a camera phone under a Muslim woman's burqa. Spencer's on-camera conduct horrified fellow Republicans in Georgia. State House Speaker David Ralston said Spencer "disgraced himself and should resign immediately," The Atlanta Journal-Constitution reported. GOP Gov. Nathan Deal said in a tweet: "There is no excuse for this type of behavior, ever, and I am saddened and disgusted by it." Regardless, there won't be any reckoning for Spencer at the ballot box this year. A Republican challenger already defeated the lawmaker in Georgia's May 22 primary. The Georgia legislator has been accused in the past of making offensive statements and proposals. In 2016, Spencer sought to update a 1951 state law that outlawed Ku Klux Klan members from wearing hoods at public rallies. Civil rights and Muslim advocacy groups called Spencer's bill a veiled attempt to ban Muslim women from wearing religious headgear that covers their faces in public. He quickly dropped the proposal. Spencer isn't the first public figure to be fooled by Cohen in his Showtime series. Former Republican vice presidential candidate Sarah Palin , Democratic Sen. Bernie Sanders and former Arizona sheriff and U.S. Senate candidate Joe Arpaio have also been duped. In a statement Monday, Spencer apologized for the "ridiculously ugly episode," but he refused to step down from office. He also said he has received death threats in the past and thought the techniques in the Showtime segment would prevent "what I believed was an inevitable attack." The Atlanta newspaper reported Spencer had earlier threatened legal action to prevent the network from airing footage of him. The Islamic Council on American-Islamic Relations also called for Spencer's resignation. "The ignorance and malice behind Islamophobia has led Mr. Spencer to not only pursue bad policy, but engage in humiliating and hateful behavior unbecoming of anyone — especially a state legislator," said Edward Ahmed Mitchell, director of the group's Georgia chapter. Spencer faced calls for his resignation last year after he warned a black former state legislator that she won't be "met with torches but something a lot more definitive" if she continued to call for the removal of Confederate statues in southern Georgia.